Boing is a cute little blue alien who wants to help children learn basic math, science, and literacy skills on his planet and yours! I have already written a detailed review of i Learn With Boing: Ice Land Adventures, so in this post I will write a summary of that review as well as a new review of i Learn With Boing: Savannah Adventures! Whether you're taking a trip to a world of ice or to the savannah, Boing is going to make sure you learn something along the way! Continue reading for my reviews of Ice Land Adventures and Savannah Adventures, plus a giveaway of each app! 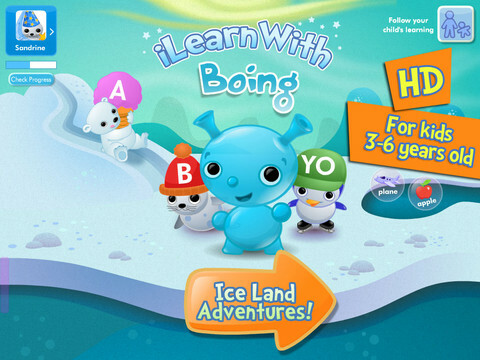 In my review of i Learn With Boing: Ice Land Adventures, I found that the application is perfect for RtI skills! 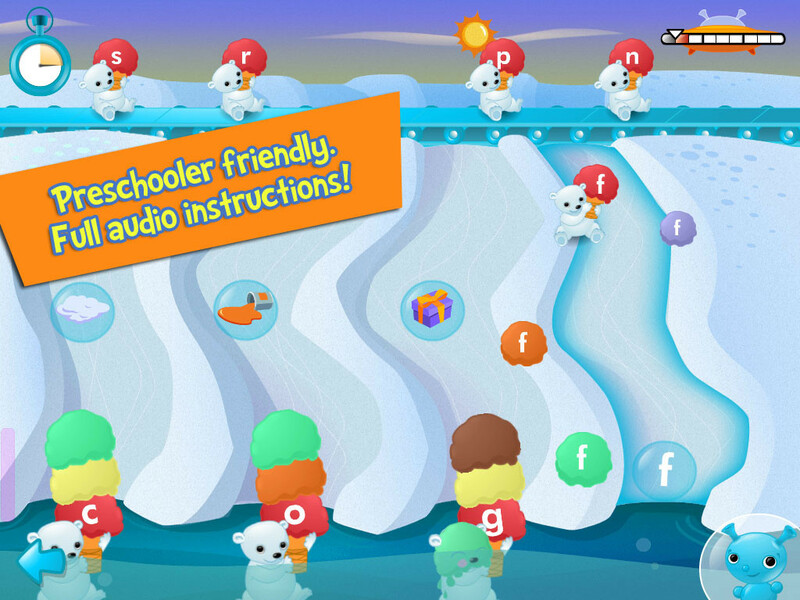 The entire application has an arctic theme from the animals to the backgrounds. There are three different levels - Letters, Phonics, and Words. 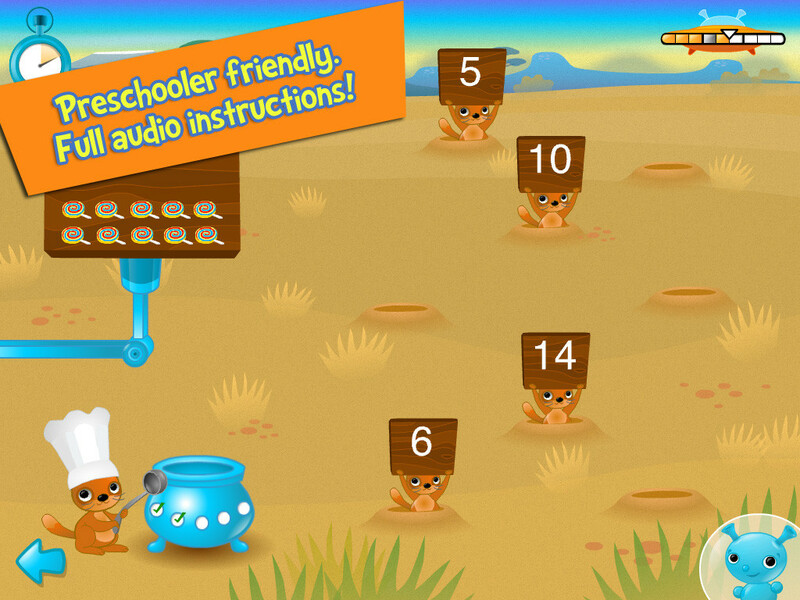 The application works on matching upper and lowercase letters, phonics with vowels and consonants, and spelling words. Different animals within the application include penguins, bears, and seals. 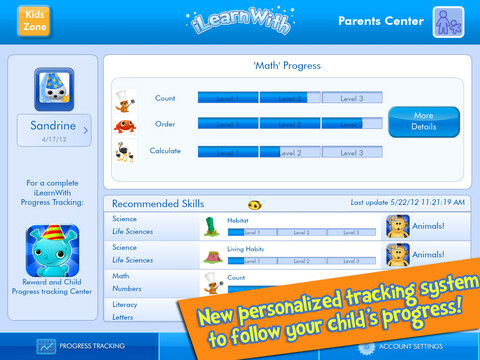 Finally, you can track a child's progress within the application! It is not only motivating for children to use but very educational! You can read my full review by clicking here. There are two blue buttons in the top corners. These are for tracking a child's data. The one on the left is to register for an account with i Learn With to track progress and receive news about upcoming applications and information. The other is a "Parents Center" in which you can log in with your i Learn With account to see progress and recommended skills for your student. Tapping on the "My Apps" backpack will cause your collection of i Learn With applications to appear. To buy another i Learn With application, press on the "Store" tab and select the one you wish to purchase. Make sure your iTunes account is connected to your iPad to purchase and download an application on the iPad. Press the orange arrow that says "Savannah Adventures" on it to begin application play. Anytime you wish to hear the instructions for a game, press Boing the blue alien in the corner and he will state directions aloud. Count the number of ingredients on the meerkat's platter to put in the pot to cook. If you get the number correct, the ingredients will pour into the pot. If the number is incorrect and does not match the number of items on the platter, the meerkats popping out of their holes holding the pieces of wood with numbers on them will either bump their head with the wood or bite into it and you will have to find the correct number to continue. Once five platters have placed in the pot within the allotted time, the student will move on in the application. Level one allows for counting of smaller numbers, level two advances to numbers up to ten, and level three advances to twenty in a group of ten and a group of another amount. 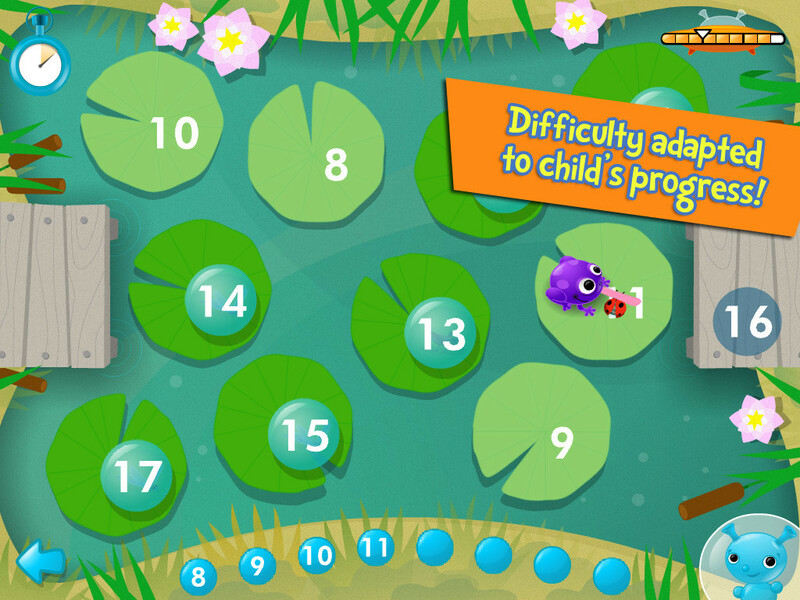 Children must count and press numbers in order on the lily-pads to work their way up to the number shown on the dock at the other side of the screen. As they press the numbers, the frog will jump from lily-pad to lily-pad. If they wait too long, the lily-pads will sink and if they press the incorrect number in order a sound will play and the frog will remain on the current lily-pad. In level one, numbers go up in order to the early teens starting with any number. In level two, numbers go up in order up to twenty starting with any number. In level three, children may count down, count by tens, count evens, or count odds depending on the pattern. The numbers will appear in order in blue circles at the bottom of the page. This game can be played as either one or two player. Children must place as many ostriches on a truck as the number on the side by clicking and dragging. If two player is being played, whomever gets the correct amount of ostriches on their truck first will win the round. In level one, ostriches are by themselves to be dragged onto the truck. Sometimes the truck starts off with ostriches on it and sometimes it does not have any. Children can press a circle on the side of the truck to view how many ostriches are already in the truck to help them determine how many more they need. 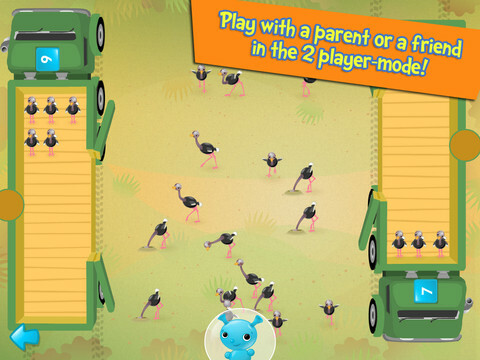 In level two, ostriches can be picked up in pairs and the number of ostriches to place in the truck is higher. In level three, children may have to take ostriches out of the truck (subtraction) and can also grab ostriches in groups of three. If the incorrect number of ostriches is in the truck when the doors are pressed to close, the doors will open back up until the amount is correct. Every so often a child may win a prize (usually every three trials). These prizes are collected within the application and can be opened to play within i Learn With's free application: Planet Boing! You must have downloaded this application on your iPad to play with them. The fact that there are three different activities is perfect for use with different students in the schools who are working on different mathematical skills. There are three different levels within each game, so it is easy to determine the appropriate level a child should begin play with. The theme as well as the animations of the application is motivating and adorable to encourage students to keep learning! Tracking data within the application makes it easy to chart a child's progress to show to parents. It would be great to be able to pause game-play so that a skill can be talked about, especially between levels. Even though there are three different levels and a common pattern to level progression, it would be great to have a more detailed description of what is happening next. For example, if moving to counting by ones to counting by tens, it would be great for Boing to state "now we're going to count by tens!" Vocabulary/Receptive Language - Talk about the different animals in the Savannah and see how many different animals a student can come up with. Ask if children have seen any of them at a zoo. Research meerkats, ostriches, and frogs, what they eat, where they live, when they sleep, who their predators are, etc. Compare and contrast meerkats, ostriches, and frogs or other animals in the Savannah. Teach the concepts of more, less, addition, subtraction, pairs, and counting. 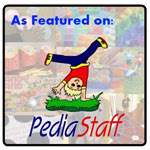 Discuss action words such as pouring, stirring, walking, hiding, jumping, and more. Expressive Language - Ask the child what he or she is going to do next in the application. Have children state or write a story about Boing or the different animals in the application. 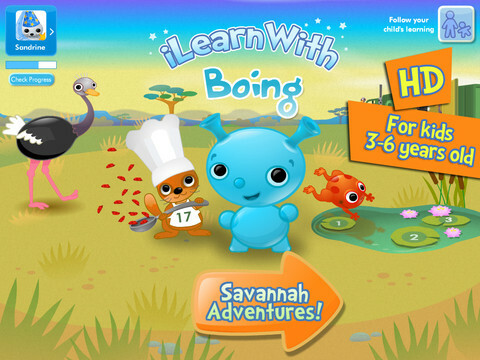 i Learn With Boing: Ice Land Adventures and i Learn With Boing: Savannah Adventures are both available for $2.99 for the iPad. i Learn With - Planet Boing! HD is free for the iPad to use the rewards from the other applications. What is exciting is that on September 6th, 2012, all of the applications will be universal for the iPod Touch, iPhone, and iPad! 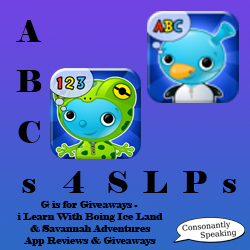 Consonantly Speaking was given codes from A4CWSN for the previous review of i Learn With Boing: Ice Land Adventures. 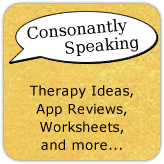 Consonantly Speaking was given a code to review Savannah Adventures as well as codes for Ice Land and Savannah Adventures to give away for this review from Tribal Nova/i Learn With. No other form of compensation was given.